JCDecaux has won the Land Securities contract for digital outdoor advertising at Trinity Leeds, the major shopping and leisure development that is set to transform the city’s retail offer. Land Securities awarded JCDecaux the seven-year contract following a competitive tender that will see Trinity Leeds become an all-digital advertising retail destination when it launches in the spring of 2013. 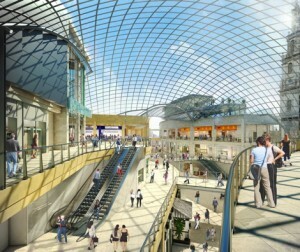 Trinity Leeds is the only major large-scale retail and leisure destination that will open in 2013 in the UK and will transform shopping in the North of England. This new vibrant city-centre destination will include key retailers: Mango, Hollister, H&M, Topshop, Oasis and Fossil plus Next, Marks & Spencer and Primark and there will also be a line-up of leading restaurants will include Conran Restaurants, Yo Sushi, Giraffe and Carluccio’s as well as the first Everyman cinema outside London. JCDecaux will work with Land Securities to create a network of digital six-sheets strategically located across the centre in one of the largest deals of its kind in the Land Securities portfolio. This entry was posted on Monday, June 18th, 2012 at 07:28 @352 and is filed under DailyDOOH Update. You can follow any responses to this entry through the RSS 2.0 feed. You can leave a response, or trackback from your own site.